First day of school, first day of school!! My inner child chants. It still hasn’t felt real that I’m here, even if it has been almost 10 days. I’m excited to get onto a schedule and have a routine here, but it’s also been nice to not have a plan and just run around Italy (lol prolly not safe but…..). Speaking of running around Italy, I was not aware how easy travel was once we were settled in Cortona. An hour from Rome and Florence, 10 minutes from a lake-turned-beach, and minutes from neighboring Tuscan cities just begging to be explored. Yesterday I paid 21 euros for a round trip train tick to Florence and boy was it worth it. The morning started with us begging broke college students and attempting to save money by not calling a taxi. Our dear friend Evan at the Tabbachi informed us that it was only a 20 minute walk from Cortona to the train station at the bottom of the mountain. 20 minutes isn’t horrible, we all though. 3.5 miles later, we were half way to Arezzo and realized we probably should have made a right instead of continuing straight. 5 miles later, we end up at the train station- a dumpy little stop with peeling paint and no ticket attendants. We cautiously boarded a train we thought was heading to Florence, and to our luck it was!! We chatted for the hour train ride, attempting to plan our day without having wifi to look up non-touristy things to do. No museums, we decided since we would be returning in July with the Art History teacher. We arrived in Florence, figured out some maps, bought some paprika Pringles (oh my god-to die for), and set out to find a café. The sky rumbled ominously above us, but we didn’t let the dark clouds dampen our spirit. When the sky opened up in torrential downpour, we hid in a tourist trap café, taking advantage of the free wifi. We were determined to find a particular pizza place, so after admiring the Florence Baptistry and Ghiberti’s bronze doors, we headed towards Ponte Vecchio. What’s cool about Ponte Vecchio is the jewelry shops that line the bridge; some have been family owned there since the early 1900’s! Google maps said a 10 minute walk, so 30 minutes later when we still went behind served authentic Florentine pizza, we were a little piffed. After asking and receiving directions to Via Maffia (I kid you not that was the name of the street) in Italian, we finally found Munaciello….and it was closed. Tired and hangry, we settled into a hole in the wall pizza place overlooking the river. The pizza was amazing, the service great, and the waiter was cute. And it was conveniently located next to Trip Advisor’s number 1 ranked gelato spot. After 3 scoops of berry cheesecake, dark chocolate, and caramel, I could see why. We ended up getting caught in a mini tornado, almost losing our gelato due to weather related incidents, hiding in a random building, and eventually spending a pretty penny at Zara’s. Exhausted, we made the decision to take the train home around 5 p.m.
We hopped on a train heading toward Arezzo without a thought. 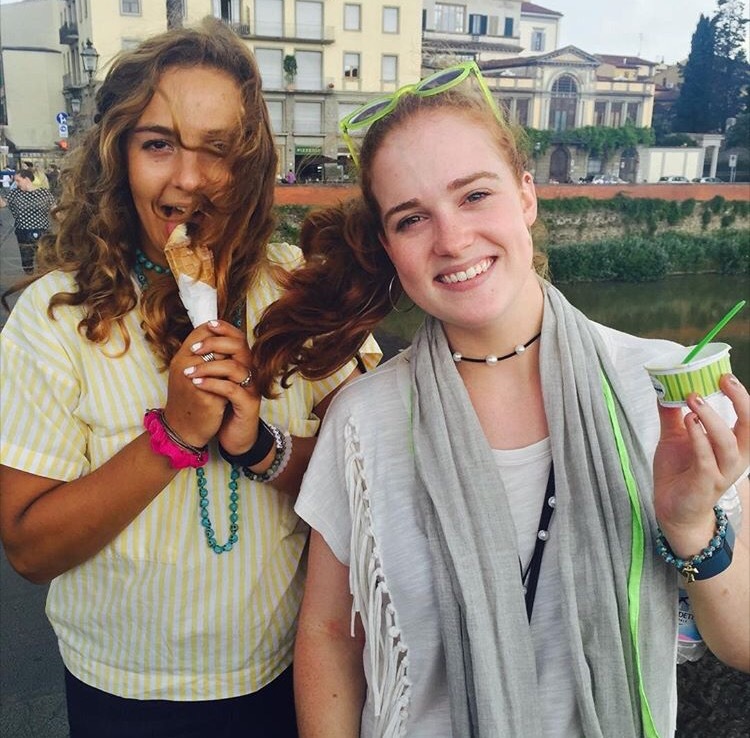 An hour and a half of snoozing, 20 questions, and recalling that amazing gelato, we still hadn’t arrived in Cortona. 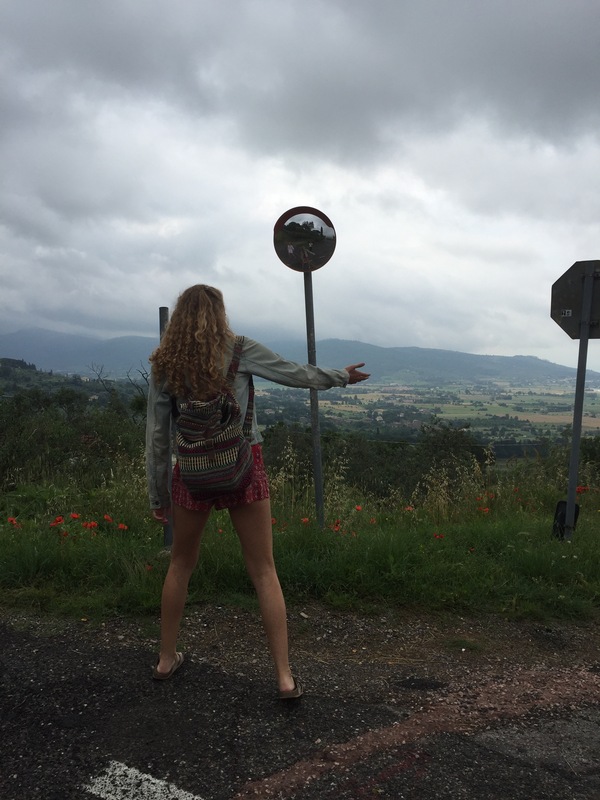 A man came over the intercom and informed us that Arezzo was the next and last stop….but we needed to go to the Camucia station…. We depart the train in Arezzo around 7:00 and glance around while the sun rapidly set behind us. We figured hmmm 2 miles back up isn’t that bad, thinking Arezzo was close to Cortona. I hailed a taxi just for shits and giggles and asked him how much it was going to be to take us up the mountain. “Cinquanta euro” he tells me. I look at him like he has 3 heads. “But we’re only like 3 miles away!” I exclaimed in poor Italian. He laughed and informed me that we were not 3 miles but 30 kilometers (almost 20 miles) away from Cortona. With a defeated sigh, we split the 50 euro taxi and finally started heading home. Bruce Springsteen was on the radio, so I made small talk with the driver in slow but accurate Italian. He laughed and told me his favorite song and I told him mine (Born to Run). I also informed him that my mom was in love with Bruce and that was met with a loud guffaw. We chatted like fast friends about my studies and his driving and I was so excited!! A real conversation in Italian! Eventually, 30 km and €54.60 later, we were nestled back into our little mountain town.